Travel is one of the best ways to educate your children! Oh, but wait... then there is that dreaded long flight, trapped in those tiny chairs with your super excited and bored child! Well worry no longer! Fly It Quiet Travel Activity Guide will keep your kids entertained as they complete fun cultural activities and learn all about the country you are about to visit! Yes! You can sit back and relax on the flight and begin your much-needed vacation! We designed these travel packs as we wanted our kids to learn more about where they were going and the culture! These kid's travel journals were also the perfect way to track their learning to bring back home and share! These are the perfect travel games for kids! are full of fun interactive travel games, country facts, cultural activities, travel journals and more that have been designed by an educational consultant! have a deeper appreciation for the culture you are visiting! easily make new friends along the way as they learn the basics of the local language and customs. Fly It Quiet Travel Activity Guides teach your children how to introduce themselves, say please and thank you and other important phrases! be excited to try all the delicious local foods and fruits that they have learned about. learn how to do currency conversions through educational travel games ( 9-13 pack). have a wonderful travel journal keepsake of your family holiday! Great to show their teachers, classmates and grandparents! Download and Print your Fly It Quiet Activity Travel Guide Now! No need to wait for anything in the mail! ( Don't have a printer? Ask friends, relatives or your boss to print it. Just be sure to bring them a nice souvenir from your trip! 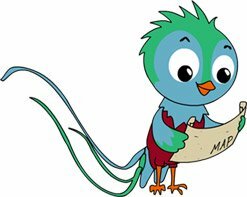 Alex, the Quetzal is your kid's official travel guide. He will introduce your child to the culture, language, food, wildlife, flag, currency and more of the country where you are going on vacation! Fly It Quiet Travel Activity Guides have 30+ pages filled with entertaining travel games, travel coloring sheets, country facts and travel puzzles, stories and more. If you have more than one child you only have to pay once and you can print multiple copies! & Many More Trip Activities! Don't see your destination here? Send us an email and let us know when and where you are traveling to. We will email you as soon as we have the Fly It Quiet Travel Activity Guide available for your destination! Have fun with these super cool travel games for children! Add the Fly It Quiet Activity Pack for your travel destination(s) to your shopping cart. Click the View Cart button to checkout and make your payment through PayPal's secure servers. You can pay with Visa, MasterCard, American Express or your PayPal account. You will be emailed a download link immediately and you can instantly download your Fly It Quiet Activity Pack. The activity pack is a .pdf. Most computers already have a PDF reader installed , but if yours doesn't you can get a FREE copy here. If you are not satisfied for any reason we will refund your money. Let us know within 90 days and you will receive a full refund. 1. Fly It Quiet Travel Activity Packs for kids look best when printed in color, however black and white still works great. 2. Don’t forget to pack coloring pencils or markers for these unique travel journals. 3. If you want to save paper, print on both sides.